Two posts in one day! I know! This has been a pretty event filled weekend though, so I though I should hang with you guys a bit longer and tell you about Saturday. My mom had a birthday a few weeks back and I was really trying to find something different for her. I know what she likes and I know what I usually get her, but I figured this year should be different. I saw something on my Facebook about a paint bar close to me. 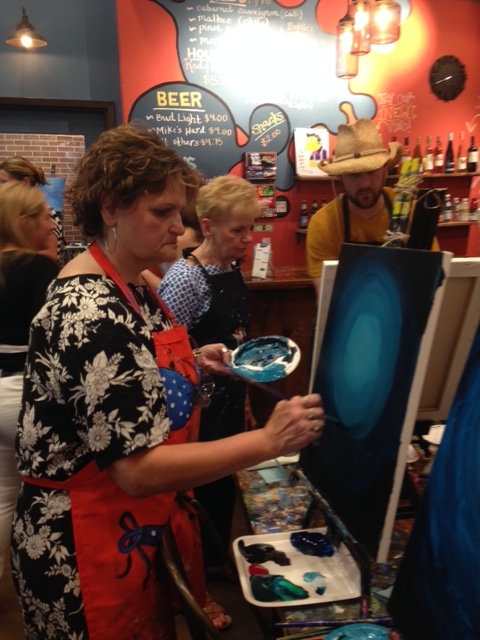 I have heard of paint ball, and decidedly knew my mom would not fare well with that, but I had never heard of a paint bar. I found out what it was and basically you look at their schedule, find a painting you like, sign up for the session. I talked about it with K (she is very artsy, me not so much), and we both thought it would be fun. 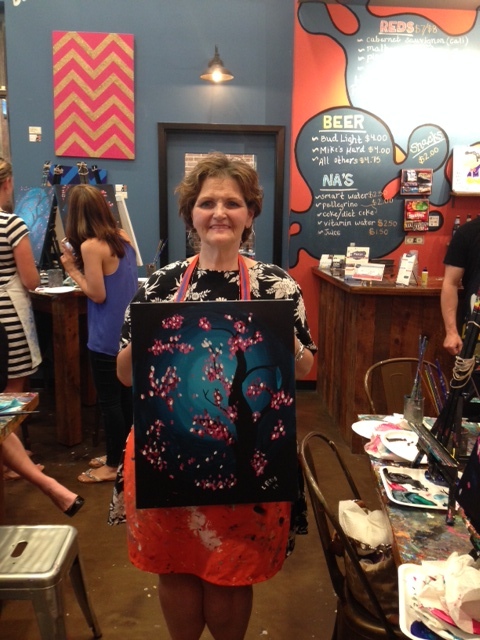 I thought that it would be nice to do something outside of the box with my mom so a plan was born. I took the first available Saturday, which was yesterday. I was feeling quite fine, I mean, how hard could it be? We showed up early (planning on my part – my mom is notorious for late) and looked around. 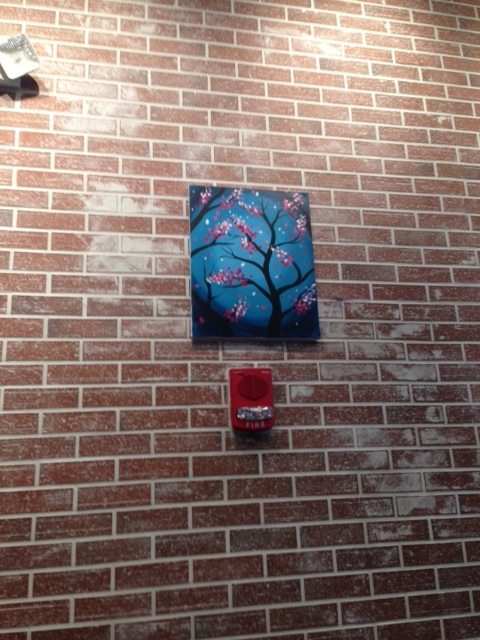 It was filled with white canvases, painted pictures on the wall, a cute little bar. We found our spots and waited for the class to begin. 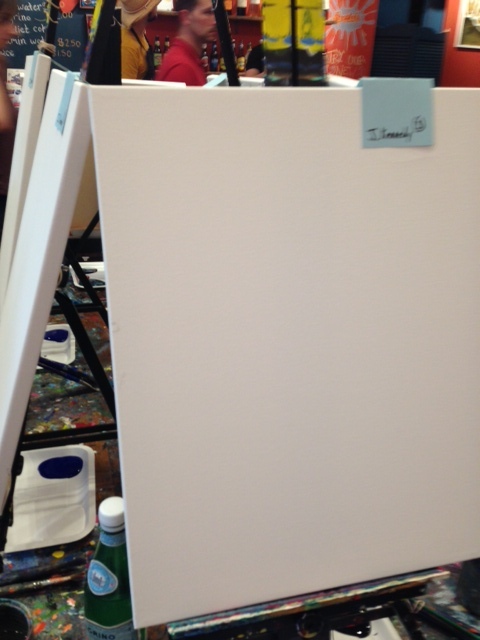 White canvas, so full of promise. What we were going to be painting. 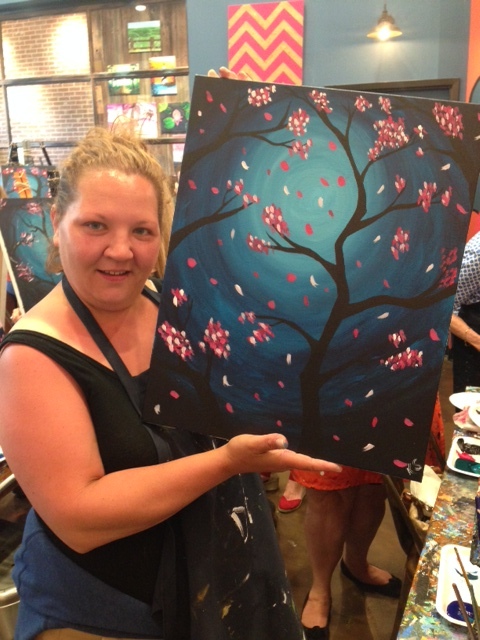 It wasn’t even the picture I had signed us up for, but I decided it was still a cherry blossom tree, so good enough. Friends, meet Jeremy and Brian. 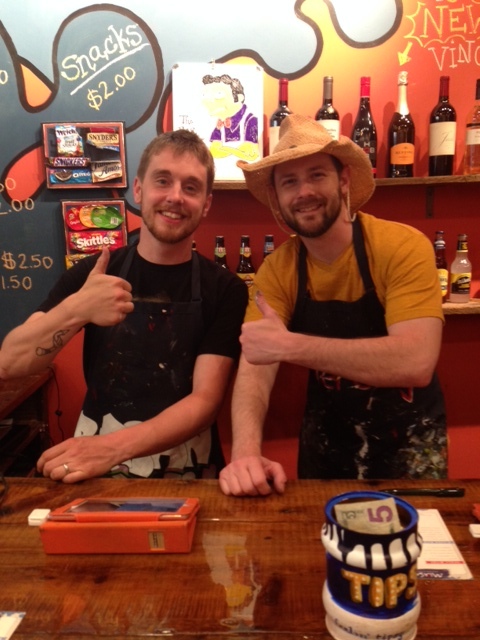 Jeremy is wearing the hat and he was our artist teacher. Brian also teaches, but today he was helping out Jeremy. It’s as if they knew I would be coming and would need extra help. So, Jeremy gives a great talk before we begin, and I am still feeling very confidant. Then it began. He told us to dip the brush in the paint and start mixing colors. This is where I began to panic. I don’t art. I sometimes pretend to art, but it isn’t pretty. I was never good at drawing, painting, pottery, etc. I am logic and precise. I like directions that spell things out. I have no talent when it comes to the being creative. Just instilling this fear in me wasn’t enough for Jeremy. Nope, he wanted to take it a step further. He wanted me to put the paint on the canvas. Jeremy took it a bit far. That was commitment. Doesn’t Jeremy know or care about how I feel? He did not. 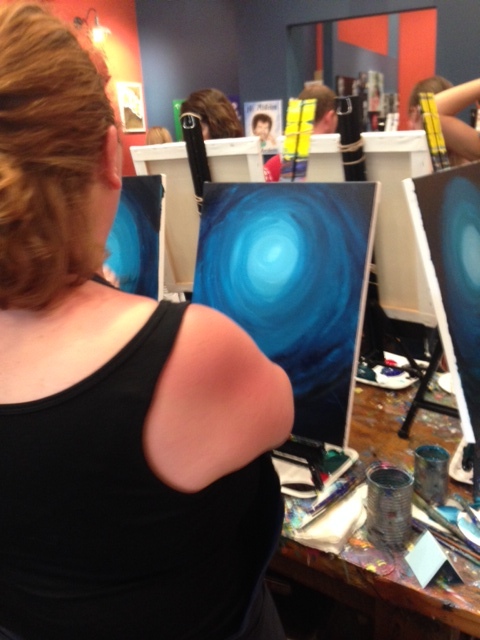 He kept talking, telling us to not only touch the brush to the canvas, but to move it around in a circle. Damn it, Jeremy. Damn it all to hell. At one point he suggested a break and I looked at him and yelled, “Jeremy, I am stressing out!” Didn’t he understand that my circle didn’t look like the circle on the wall? He came over, taught me how to use a paint brush to make a circle, and as I kept doing it, he walked away. I was left alone. K kept reminding me not to stress out so much, that it was just the background. I had a hard time with this, because stressing out is what I do. My mom could do a circle. Look at Jeremy, helping someone else, and I was still freaking out about my circle. Here is K, working on her circles. As I sat there, looking at everyone else who did not seem to be having a nervous breakdown, I realized that they didn’t seem to care as much about their circles. They accepted them and kept going. I learned about art in that moment. It isn’t about having a perfect circle. It isn’t about blending your colors like everyone else’s. The bottom of mine at that time actually looked like a choppy sea and I was debating making a boat. I then set the tone for myself for the rest of the session: I was going rogue. 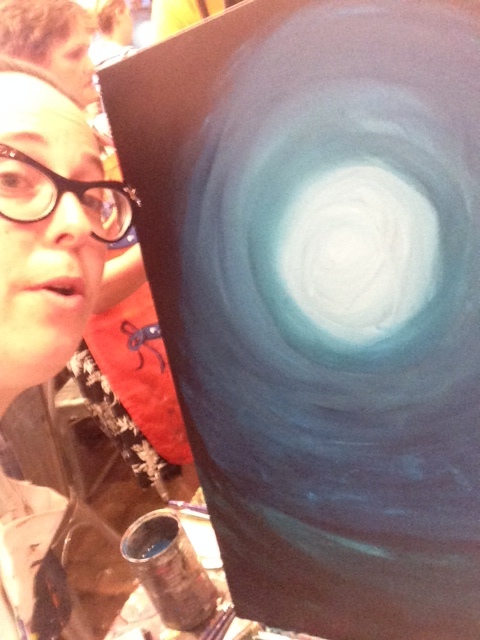 Selfie moment with the not perfect circle and the choppy sea at the bottom! I then started to relax. We got to the tree and I yelled to Jeremy that I was going rogue. He accepted this. I think he accepted my not perfect circle, and my tree that looked like Tim Burton created it and used it for The Nightmare Before Christmas. I painted, friends. 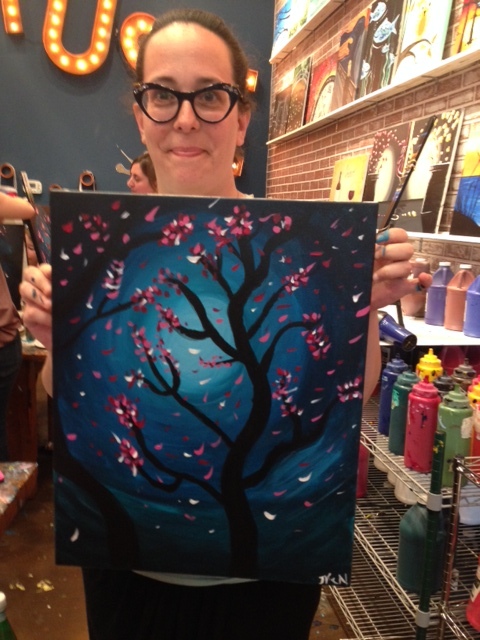 I painted a picture that ended up looking like a damn cherry tree. I let go, and just decided that I was okay with a pitchfork branch. My mom kept saying her tree was too fat. I had a pitchfork. Some trees are fat, and some have pitchfork branches. It was an amazing, awesome, experience, with two women who mean the world to me. I learned to let go, accept, and it was okay if it wasn’t perfect. I’m proud of my painting. I am proud I created something. Do something that scares you and smile when you make it through. I kept looking at a quote they had on their wall, and I am going to sign off with it. Until next time friends, I hope you all have days coming up filled with so much life. This is incredible. Loved every word and loved the finished product. H, it’s okay not to have a perfect circle. Happy New Year! Beautiful, Jaime! Thanks for sharing your process. 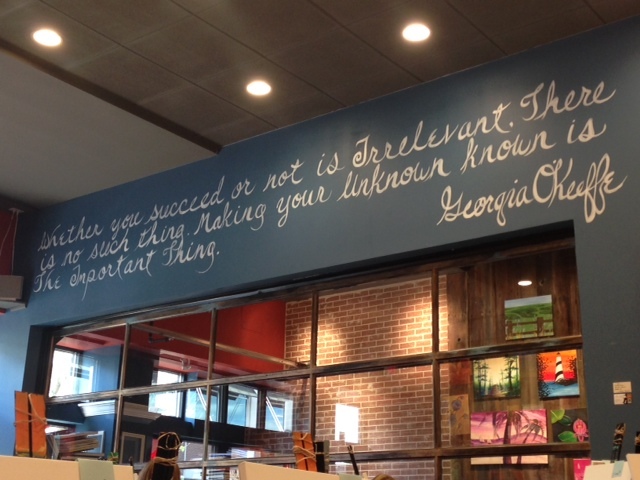 And I love the Georgia O’Keefe quote.